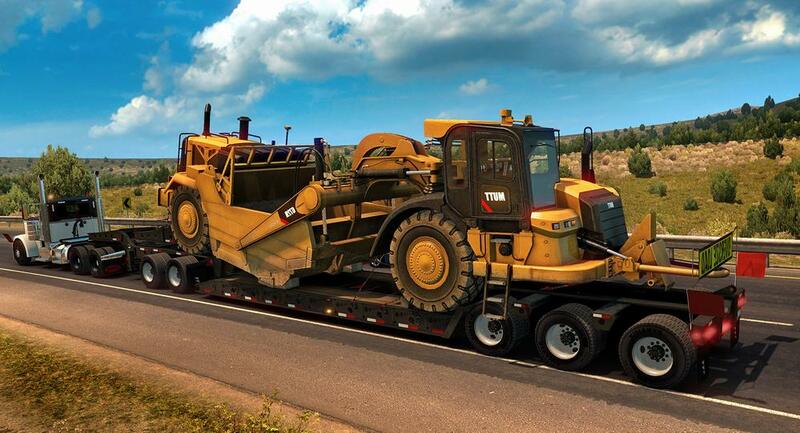 This guide will list you the 5 achievements of the DLC for American Truck Simulator. 2 of the 5 achievements are a bit tricky, especially "How Heavy am I?!". But for the rest you just need to be careful when driving and you can save a lot of time with the right tactics, explained in this guide. You can filter Heavy Cargo missions by clicking on the right field in the upper left corner of the mission window and select the specific cargo. Heavy cargoes from the Special Transport DLC are unimportant for all Heavy Cargo Pack achievements! You can do the following three achievements as part of the "I Thought This Should Be Heavy?!" achievement. Deliver first Heavy Cargo Pack job. Heavy, but Not Bull in a China Shop! Complete a perfect delivery (no damage, no fine, in-time) of a cargo from the Heavy Cargo Pack which is at least 1,000 miles long. Earn $100,000 on 5 consecutive Heavy Cargo Pack deliveries. If you go for 5 consecutive Heavy Cargo Pack delivieries, you can go for one with 1,000 miles and you`ll easily unlock the three achievements. The distance must be over 1,000 miles when you accept the mission. If its only 999 miles and you think you can drive two more miles to get this achievement: Your wrong! As mentioned above, you can also choose 5 different cargoes for your delivery, so that every delivery will count for the "I Thought This Should Be Heavy?!" achievement. This one is a bit tricky. You need to accept a mission where you have to deliver a Transformer and use a truck with a sleeper cabin. But thats still not enough. You also need to fill your fuel tank with the maximum amount of gallons and than you can go and drive to a weigh station! Normaly this is enough to unlock the achievement. There are 9 different cargoes you must deliver for this achievement. As said before, the ones from Special Transport do not count! Tip in advance: Go and copy the list into a document and after every successful ride delete the cargo you`ve driven or mark it with another color. So you dont have to do the same cargo/route twice.